Handing my son a pumpkin pie smoothie after a long day at school makes me so happy for a few reasons. First, and most importantly, this pumpkin pie smoothie recipe is so delicious that it puts a huge smile on his face. 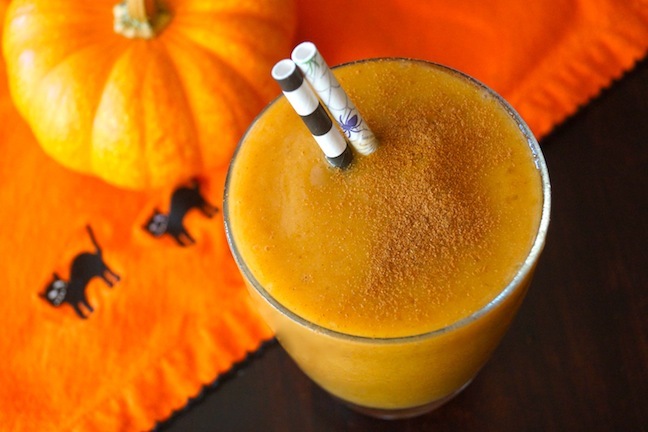 Second, between banana, pumpkin, and orange juice, it’s absolutely packed with nutrients! And third, it’s such quick and easy snack to prepare that just as he’s about to tell me he’s hungry, I slip it into his hand. And to top it off, it’s just super fun to have sweet pumpkin-filled treats during the fall months, especially October! Between banana, pumpkin, and orange juice, this is absolutely packed with nutrients and my son's favorite after school treat this fall. Step 1: Starting with the ice, add all of the ingredients to a powerful blender and blend on high until it's very smooth, about 20 seconds.